2K Sports has just revealed that reigning MVP Kevin Durant of the Oklahoma City Thunder has received the honor of being cover athlete for NBA 2K15. The announcement comes with an image of Durant with a background of what appears to be a new court for the online mode “The Park”. The game's new tagline is 'Your Time Has Come'. This is not the first time KD has been featured on a basketball video game cover. He appeared on EA's NCAA March Madness 08 and on 2K's NBA 2K13 along with Derrick Rose and Blake Griffin. It's also worth mentioning that Durant has done a deal to be featured as the cover star of NBA Elite 11, but unfortunately the game was cancelled. 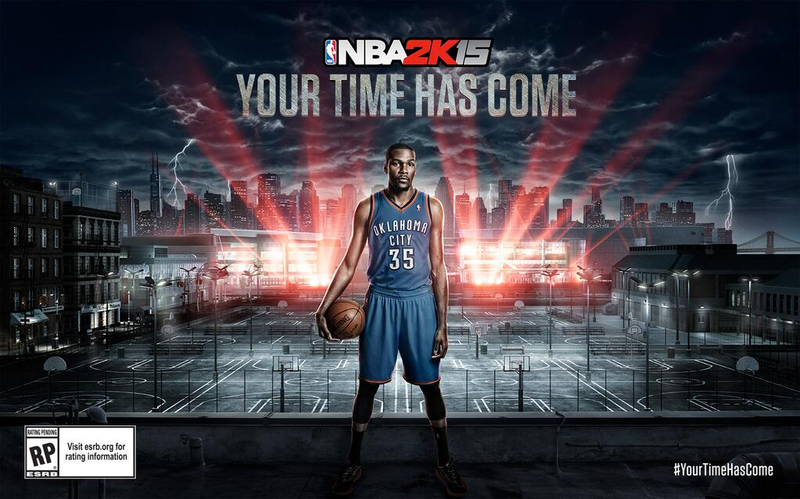 NBA 2K15 is a video game developed by Visual Concepts and published by 2K Sports. It is scheduled to release for PlayStation 4, Xbox One, PlayStation 3, Xbox 360, and PC on October 7, 2014 in North America and October 9, 2014 in Asia, Australia and Europe.